Watch Bigg Boss 11: Akash Dadlani’s Bang Bang Rap With Arshi Khan And Bandgi Kalra After Eviction! Akash Dadlani is partying with Arshi Khan and Bandgi Kalra after getting evicted from the show Bigg Boss 11! The controversial TV reality show Bigg Boss 11 is very close to its end. It has been one of the most successful seasons of the show. As the show is heading towards its finale, yesterday we saw the last eviction of this season. Yes, Akash Dadlani had to leave the BB house last night. But it seems that he is all happy coming out of the house. 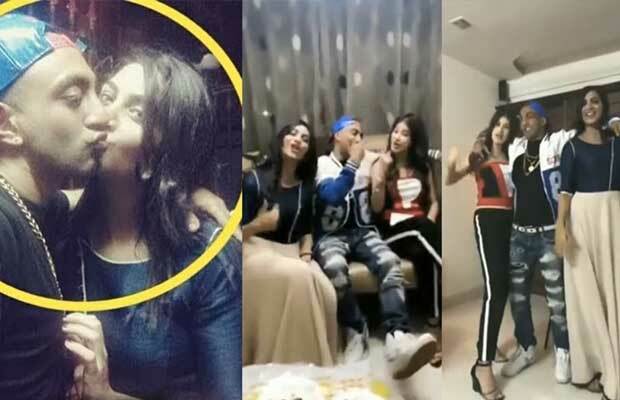 As he has been spotted partying with his co-contestants from the show, Arshi Khan and Bandgi Kalra. It is no surprise that the evicted contestants, after coming out of the house, first meet their co-contestants from the show. Akash also had a re-union with the two ladies and he seems to have enjoyed a lot. A video has surfaced online where the three of them can be seen doing together the ‘Akash Dadlani special’ Bang Bang rap. Later, Akash’s mother is also seen joining the trio. Talking about the show, it is currently in its finale week. Yesterday we saw that Akash Dadlani got evicted leaving Shilpa Shinde, Hina Khan, Vikas Gupta and Puneesh Sharma as the finalists of the show. We have already informed you all about the sizzling dance performance that Hiten Tejwani and Arshi Khan are going to give together in the last episode. And we are definitely looking forward to it! The grand finale is going to be aired on January 14, which is this Sunday. It will be interesting to see who is finally able to win the BB trophy! Previous articleBigg Boss 11: Salman Khan’s Mother Wants This Contestant To Win The Show! Next articleBigg Boss 11: Ekta Kapoor Lashes Out On Twitter After Accused Of Threatening Colors To Make Vikas Gupta The Winner!